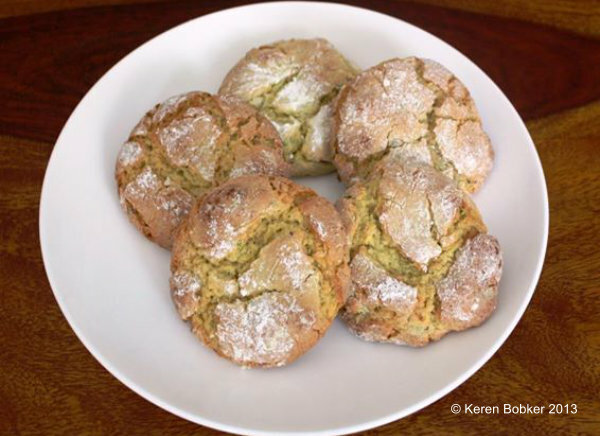 These Lemon and Pistachio Cookies from guest chef, Keren Bobker, are absolutely delicious. We can guarantee they won't be around for very long. Serves: - well, it depends how fast you are! Add the flour and salt, the lemon juice and the ground pistachio nuts. Mix to form a sticky cookie dough. Put the dough onto a floured work surface, and roll into a thick sausage shape. Wrap the sausage of cookie dough in cling-film and leave in the freezer for at least 1 hour. Preheat the oven to 190C /375F/Gas mark 6. Take the sausage of cookie dough out of the freezer: it should be firm and easier to cut. Unwrap the dough and use a sharp knife to slice it into cookies as thick as you want. Put the cookie slices onto a sheet of baking paper on a baking sheet, spaced quite far apart. If you need to bake them in more than one batch, wrap the excess dough and put it back into the freezer so it doesn't go soft. Bake in the oven for about 15 minutes, then leave to cool. Sprinkle with icing sugar and serve!